Acela Express 0003 departing Washington Station. The developers made a mistake in the amount of power for the Acela express power car - they gave it a value of 9200kw rather than 4600kw. 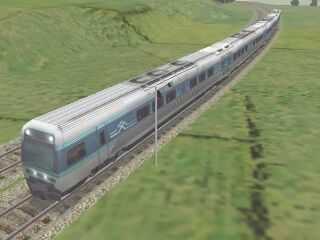 The Acela ENGine file is used by several similar locos and so the error has been carried on to the TGV (from which the Acela is derived) and Thalys for example. Here's how to correct the error and bring the Acela back to reality! Start WordPad, or your favourite Unicode-text editor, and open the Acelea ENG file in the Acela sub-folder under the Trainset folder, which in turn is found in the folder where MSTS is installed. That's it! 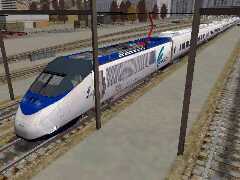 Save the file, exit WordPad and drive a more realistic Acela Express! If you have other locos that use the Acela ENGine file, use WordPad as above to edit their MaxPower value. A handy reference for this modification and others can be found in Other_Modifications.txt in Joseph Realmuto's f_calc10.zip download from the Train-Sim.com file library. These are some changes that webTrainSim is trialling with Brendan Robinson's Xplorer DMU set. Before you change your Xplorer ENGine files, copy Brendan's updates from endxplfx.zip (264kb, 29-Sep-02). You'll need to use WordPad to make changes to the ENG file of each power car: AU635a.eng, AU635b.eng and AU635c.eng, each of which is in its own folder, AUxplEA, AUxplEB and AUxplEC respectively. Further down the ENGine file, you'll find the following. webTrainSim found specs for the Voith T312 hydraulic transmission (www.voithturbo.com) and has used its values for the force and speed at which gears are changed. Note the T312 has 3 gears. Further down the ENGine file, you'll find the following. webTrainSim found specs for the Voith T312 hydraulic transmission and has used its values for the force and speed at which gears are changed. Note the T312 is 3-geared.